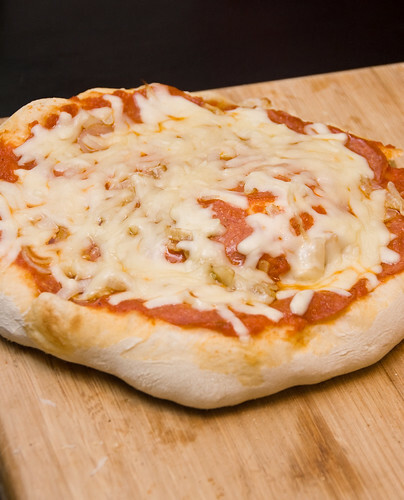 When I first saw this thread, I was thinking 'oh, cool, let's see what kinds of homemade pizza other LTH folks are making' (not realizing it was a thread on Homemade Pizza TM). But, I've been making pizza about weekly since it's a nice quick weekday dinner, easy to vary based on what's in the fridge. And, I got to thinking, it would be nice to have an LTH pizza gallery. Especially since I've been inspired by folks like Bill/SFNM, Bill/SFNM, G Wiv and Leek, Bill again (seems to be a theme) and Antonius (among many others). Selfishly (for my own inspiration) I thought it would be nice to have the pictures gathered in one place (so if anyone feels inclined to link in other posts, feel free). I use Peter Reinhart's dough recipe, divide it into 6ths and freeze the dough balls. I take one out the night before I plan to make pizza. I preheat my oven and pizza stone to the oven's max setting (550) and generally bake for about 8 min. 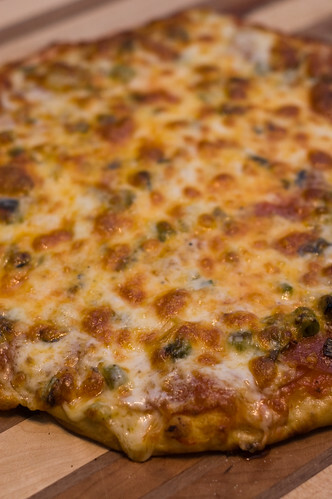 I've been making lots of pizza but I haven't been taking pictures (though I plan to remedy that). My standard faves are gorgonzola, carmelized onions, pancetta or bacon and thyme or sage and marinara, sausage, fresh mozzarella and pecorino sardo shavings. The dry cured olives from Graziano's seem to find their way onto lots of my pizzas, too. Anyway, this week I was a little laid up due to recovering from surgery (O.K., so I was milking it) and my S.O. 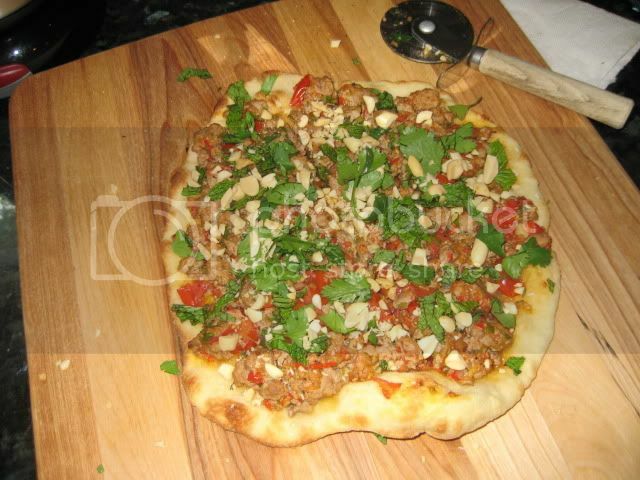 made the pizza--a Thai larb pizza with peanuts, cilantro and mint, roughly based on a recipe from Anya Von Bremzen's Terrific Pacific cookbook. This was a big departure for us but I thought it was delicious. 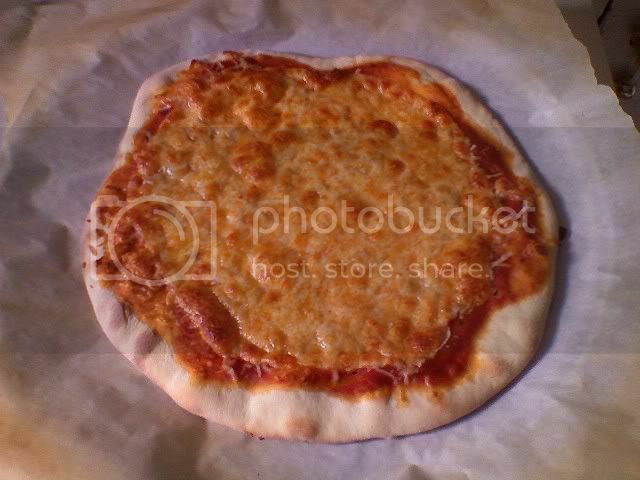 So, here is pizza gallery entry number 1. 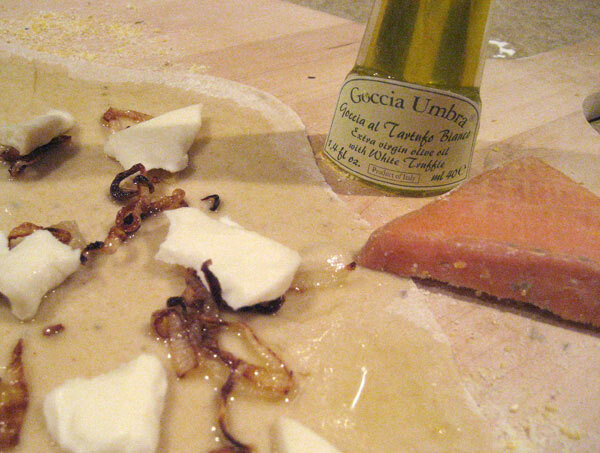 Always a favorite: truffle oil, honey, caramelized onion and taleggio. Thanks to Mark Bello for the inspiration. I have NOT been able to stop thinking about this pizza. Picked up a piece of taleggio today. Really looking forward to trying this on the next batch. I have a really good feeling about how this match with my crust. Thank you for the inspiration. Stay tuned. One tip: honey and oil do NOT want to stay together. (Bello used a commercial honey/truffle oil product, I have no idea how they got it to stay mixed.) So far, the only thing I've figured out how to do is simply whisk it as fast as I can and then spread it really quick; it will separate on the pizza but that's okay as long as it's all over it in the first place. 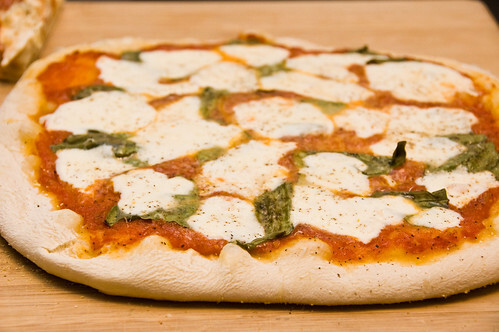 It's really good, especially when you're making other more traditional pizzas, it makes a great contrast. The temps I bake at will quickly drive off the wonderful truffle essences, so I always drizzle after baking. Looks delicious! What is Saxon Green Fields cheese? You weren't the only one. Good call--thanks for putting this one up Mike. Tried it last night. Turned out great. I highly recommend this cheese. Available at the Green City Market and at other farmers markets. These shots are actually from a few months ago, but I hadn't seen this thread until now. I had seen a video online of Heston Blumenthal making pizza, and liked the idea of using a heated cast iron pan to cook the pizza on under the broiler (so, the latent heat in the pan cooks the bottom, broiler hits the top). Needless to say, I couldn't quite make it work. My broiler just doesn't put out the heat that I needed and overall it was a failure. My only real homemade pizza success has been on the grill, so I decided to take the cast iron pan outside and try a combined approach. I put the pan upside down on the grate, waited for it to get nice and hot, and slid a pizza off the peel and on to the hot cast iron. As you can see, the bottom got a little overdone... in about a minute. I like a good char, but this was just a bit too much (note: the pizza did not go to waste, all was consumed). I let the coals cool down a bit, moved them towards the edge of the Weber (so that the heat wasn't so concentrated under the cast iron pan), and the results were *much* better. The top didn't really get browned - I need to work on getting the whole inside of the Weber heated up more so that there's more heat hitting the top. Perhaps one of the LTH Weber Masters can chime in here with some advice? My thought was to have the coals in a ring at the outer edge of the grill, with the vents wide open... who knows. I'll have to experiment more. The results weren't perfect, but they were way better than most of my homemade pizza attempts. 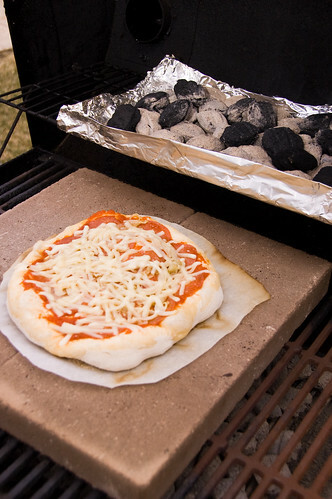 Grilling the pizza directly on the grate works quite well, but is so timing sensitive (lay down the dough, flip it, top the pizza, put on the lid and hope everything heats through before the crust burns). With this approach, you can get your pizzas ready and topped on a peel, then slide the whole thing on to the cast iron, put the lid on, and just wait a couple of minutes. dansch wrote: The top didn't really get browned - I need to work on getting the whole inside of the Weber heated up more so that there's more heat hitting the top. Perhaps one of the LTH Weber Masters can chime in here with some advice? My thought was to have the coals in a ring at the outer edge of the grill, with the vents wide open... who knows. I'll have to experiment more. Getting the heat around the pie balanced so that the top, edges, and bottom are perfectly done simultaneously is a real challenge, especially in a grill where you have less control over heat levels and distribution and when removing the lid to monitor progress also results in a tremendous loss of heat. A mistake some make is to leave the pie in long enough so that the top "looks" done. 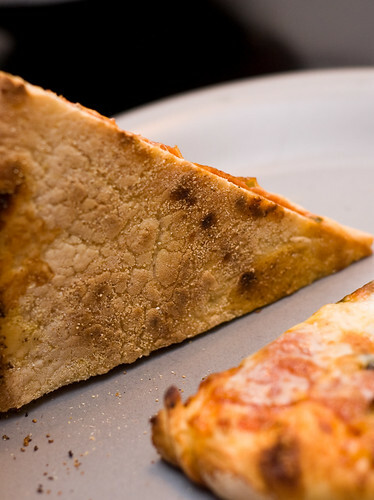 This very often results in a completely overcooked crust. I would focus on getting the crust just right in terms of taste and texture as you seek ways to get more heat to the top of the pie. In the meantime, I would use sparse toppings with maximum surface area so they will be cooked when the crust reaches perfection. Taste and texture are much more important than visual cues, which can be deceptive. Pizza in the oven last night. Two patio stones on the bottom rack, two on the top rack (with foil underneath to prevent any wayward stone dust from drifting onto my pizza). My oven is an old oven, probably over 20 years old, I'm guessing it's the original from when my apartment was built, however it still works well. Yesterday I turned it to the "bake" setting and the temp all the way past the broil mark. This kept the bottom element running almost continuously. I can't be certain how hot the oven was, but I have to assume it was over 600º. The numbers on my oven thermometer go to 550º and it was pegged way past that, almost spinning all the way around. The flavor results were great last night, but my dough did not rise/fluff during the cooking process as much as I would have liked. I think it might have been the damp cool weather we had, but I really cannot be sure, I haven't perfected dough yet. This is the same problem I have run into with grilling pizzas. I have even tried rigging a layer of hot coals and aluminum foil on my cooling rack (not using a webber), but that still didn't quite work. Bill mentioned the massive heat loss of opening up a grill and I think that is really the issue. I will be trying a few more times this summer on the grill because it will soon be to hot for heating up the oven for 2 hours, but as of right now my oven pizzas are edging out my grill pizzas in quality. Coincidentally, Mrs. B. was pizza inspired just this weekend. The crust was the romana style from Carol Fields' Italian baking book. Rises a bit and puffs a bit. A bit of bite and chew, but still quite thin. Our oven gets to 500 comfortably and with the stone, results were very satisfactorily blistered. Made a bianco with pepperoni for the boy. And a classic margherita for the third. (It's not really time for the tomatoes yet, but results wtih good cheese and basil were still adequate. Sorry we didn't think to take pics. Too hungry. But enjoyed the results a lot. Especially with a 3 Friends Shiras '03 that was a gift and I hadn't known before. Not all Smuckers like so many of them. A bit of structure. Very enjoyable. Tapler: that chorizo pie looks divine. Weekend brunch city. Been practicing my crust creation and my sauce simmering for the past couple weeks. Finally got something that resembles something pizza like. I've been using the Alton Brown pizza crust as my control of sorts. He recommends a 24 hour rise in the fridge but for this crust I let it rise for about 90 minutes and punched it down before letting it rest for a day. This one was cooked on a stone in a 500+ oven, preheated for about 45 minutes. Cooked for 9:30 to just caramelize the cheese a bit. Starting to get the hang of it, I think. Still not completely happy with it - going to start experimenting with flour soon enough. Been using Pillsbury bread flour previously. 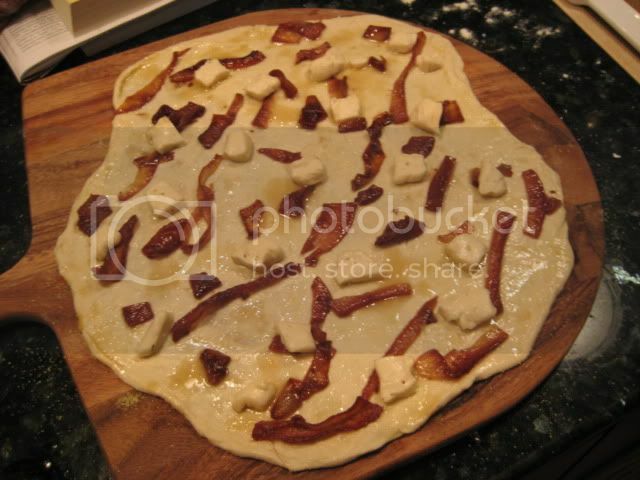 Found this crust on the pizzamaking forum for "chicago thin crust." Probably going to give that one a whirl soon enough as well. 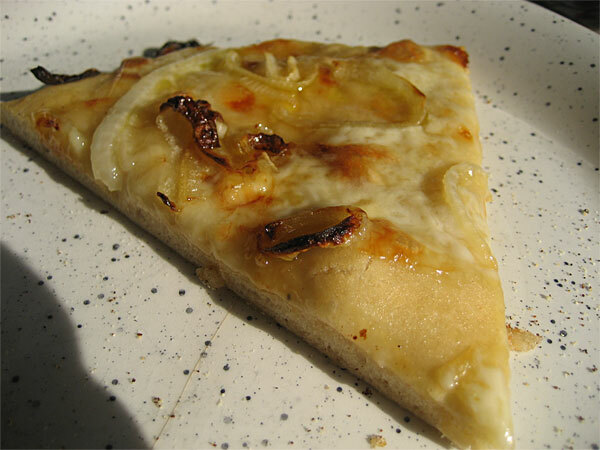 I have another crust in the fridge for tonight or the next day which I'm going to use for a bbq chicken pizza. Got around to trying the Mike G pizza. Nothing short of terrific! So I take it you did honey before, drizzled truffle oil after, and were satisfied? Mike G wrote: So I take it you did honey before, drizzled truffle oil after, and were satisfied? Yes. 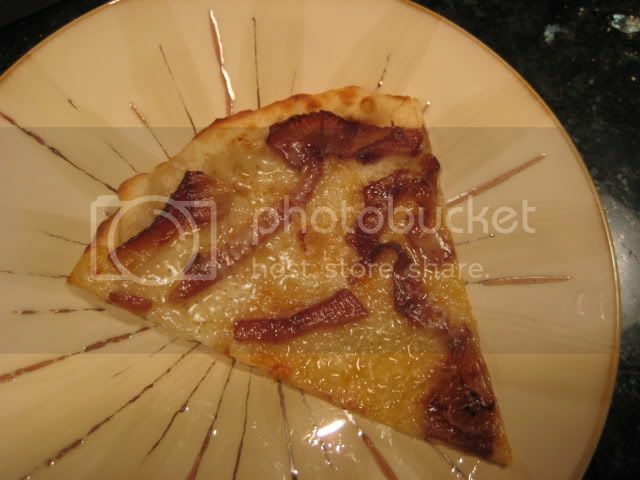 I had the honey bottle soaking in hot water so that it drizzled easily onto the unbaked crust. Then onions and cheese. The moment it came out of the oven, I hit with the truffle oil. Thank you so much for the inspiration. This is a keeper! I made 2. The second one had about the double the mass of toppings as the first. I liked the first one better. Less is more. I read through some of your old threads but don't see what kind of rig you're using to bake. Also, would you mind sharing your dough recipe? I saw in the older threads that you use Molino San Felice flour, is that still the case? You are going to cry. His rig is a brick wood fired oven in his backyard. At one time I believed San Felice was superior, but once my skill level improved, it became clear that Caputo 00 Pizzeria flour was better suited for my methods and tastes. 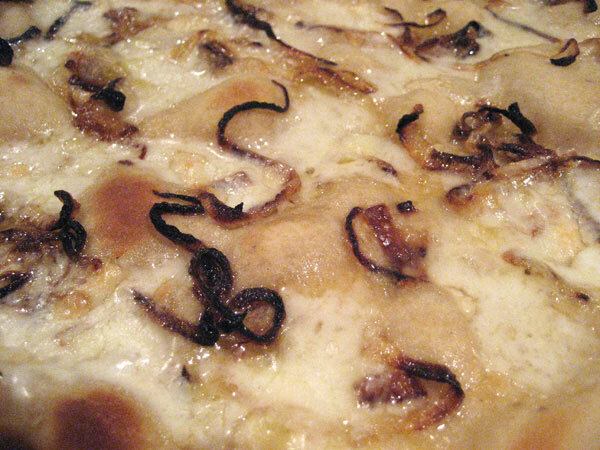 Bill/SFNM wrote: At one time I believed San Felice was superior, but once my skill level improved, it became clear that Caputo 00 Pizzeria flour was better suited for my methods and tastes. Is this 25kg mail order proposition, or do I stand a chance of finding a place in Chicago that sells it? 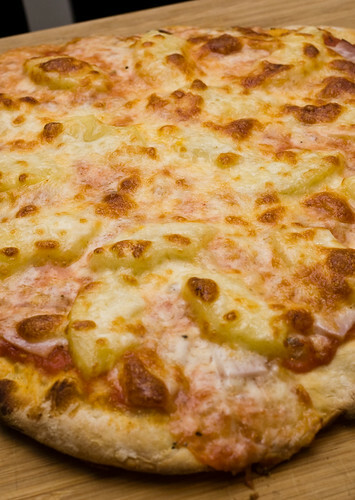 Fox & Obel had King Arthur's equivalent of 00 flour at one time, but it makes a rather bland pizza unless you achieve the temperatures necessary to take advantage of it. I used it a couple of times and posted somewhere here. dansch wrote: Is this 25kg mail order proposition, or do I stand a chance of finding a place in Chicago that sells it? Pennmac has 1kg bags. Shipping can be high. The baking area in your grill should be in the 800F+ range for this flour to produce good results. 900F+ is even better. See this thread for some discussion on using that type of flour. 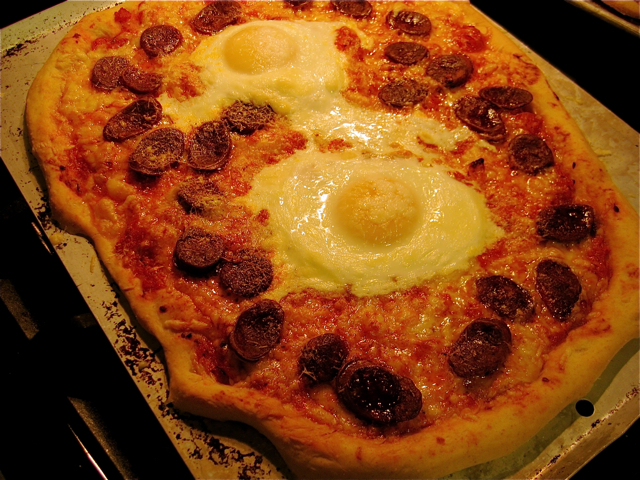 2) This second one is actually a pizza combo I make a lot. Unfortunately, due to a combo of multitasking, dough overhandling and over-stretching, this particular pizza stuck to the peel and was a complete disaster. The center was too thin and the edges were all bunched up. Believe me, there were a lot of expletives flying around the kitchen and my SO was cowering in a corner. But, it didn't taste too bad, given the toppings. I have to say, it was not my finest pizza-making hour. 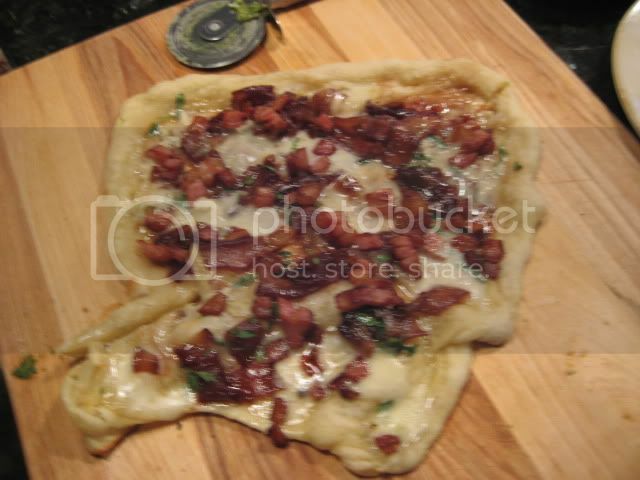 Anyway, here are the toppings: Gorgonzola, carmelized onions, thyme, bits of crispy pancetta. Bill/SFNM wrote: Got around to trying the Mike G pizza. Nothing short of terrific! 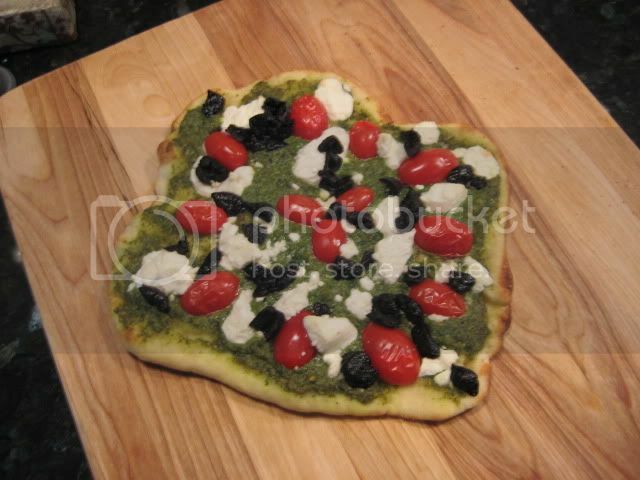 Also wanted to ask, Bill, do have a pizza photography studio next to your oven? If you need to make a little spare change on the side, you should start putting out a pizza calendar. Or make posters. Or something.